As expected, the Ultimate Fighting Championship fully supported the Nevada State Athletic Commission’s decision Thursday to ban therapeutic-use exemptions (TUE) for testosterone replacement therapy (TRT). The committee voted unanimously today to rid the controversial treatment from all combat sports taking place in the state, effective immediately. Present and past fighters previously issued TUEs for TRT would no longer be permitted to use the doctor-prescribed regimen. 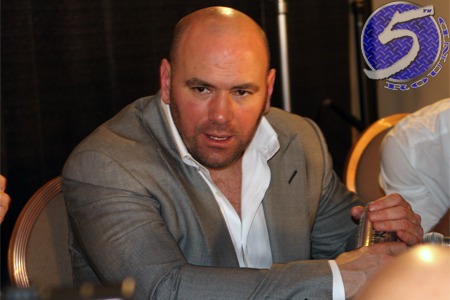 UFC president Dana White (pictured), who has teeter-tottered on the legitimacy behind TRT in the past, most recently said he would be all for erasing TRT from the sport. White has also said the promotion would follow the rules enforced by the NSAC for all out-of-the country shows they oversee, when no governing body is available. Therefore, if Nevada banned TRT, so would the UFC for overseas events. White held true to his word after news broke of the NSAC’s ground-breaking decision. Of course, it will be up to other state athletic commissions to follow Nevada’s lead if MMA is to enjoy a complete ban of TRT. Vitor Belfort, Dan Henderson, Chael Sonnen, Antonio “Bigfoot” Silva, Frank Mir, Ben Rothwell, Nate Marquardt and Todd Duffee are current UFC fights known to be on TRT.